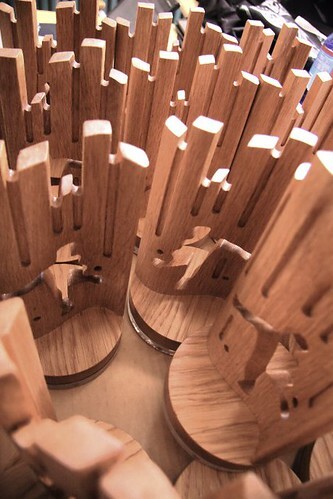 “This is a really interesting project, since we don’t usually get to design any sort of trophies in school. Footbag wasn’t really familiar, so it was nice to get into it. I started the process by discussing with the organizers about the sport and the tournament: what sort of values they have, and should the trophy represent something. Some of the keywords that came up were urban, wood and nature. The tournament team also wanted to have the tournament logo in the trophy in some way. I made different sketches of the ideas, and after more discussion we had a design that satisfied everybody. So it was time to start the fabrication. I used CNC machining to carve the pieces out of oak and acrylic, and laser to burn graphics on the acrylic bottom. The three-piece design was quite simple to put together, but required precision and care to get just right. Finally after hours of sanding, oiling and polishing the trophies were ready. There are 1 Comments to "How the trophies were born"